Dear Readers, you are in for a super awesome treat today. This month’s spotlight is Dave Jeffery. Fabulous friend, amazing writer. I met Dave through one of my author friends on facebook. Dave is kind, funny, a joy to talk to, and a brilliant author. I have not read all of Dave’s books, they are on my “To Be Read” pile for sure. I have read FINDING JERICHO. I did post a review of it when I finished it. Amazing and breathtaking book. About a boy and his mother, who move in with her brother, after the step-father dies. The book is written from Jonathan’s (the son) point of view. On his first day of school, he learns that his uncle is known in the town as “Raving Ron” and that his uncle might not be of sound mind. Jonathan is taunted and teased for this, and he just desperately wants to fit in. He is threaten by a small (3 boys) gang at school. Things are not going well for Jonathan. Jonathan’s uncle is trying to overcome his illness, and he has his quirks. Jonathan lashes out at his uncle, and puts him in a downward spiral. As Uncle Ron is admitted into the hospital, the Misfits (the small gang at school), dare Jonathan to go into a run down house. He must stay the night there. He is met by an unlikely person and things are put into perspective. Can “Raving Ron” be helped? Who is Jericho? Does Jonathan make it? 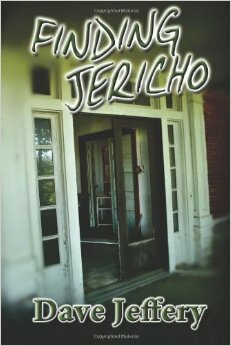 FINDING JERICHO is only $3.99 for KINDLE right now. I was left sobbing by the end of this book. What is done for Uncle Ron, and by whom, spoke volumes to me. Loved this book. I think of it often, and it will stay with me forever. Other books by Dave that I own are his NECROMANCER series. Dave talks about working on book 3 in his Q&A. Be sure to check out his Author page on Amazon to get a complete listing of all his books. When Dave isn’t writing, he works in the medical field, and loves spending time with lovely wife and kids. Thank you so much Dave, for taking the time out of your amazingly busy schedule to answer a few questions for me. You, my friend, are a rock star. Yes. There wasn’t a lot of money kicking around when I was younger, so reading was a staple source of entertainment. I usually borrowed from the local and school libraries. I also read a lot of comic books, especially those published through Marvel and DC, plus 200AD. In a standard week I could easily read three or four novels. 2. Did you have a favourite book when growing up? I had several from different genres. I loved Treasure Island and Ivanhoe in my earlier years; I was given the latter as a prize for a piece of English composition in school. By the time I was eleven years old I had discovered the horror genre and was reading – though I probably shouldn’t have been – James Herbert, Guy N Smith and Stephen King. The Fog (Herbert) and Night of the Crabs (Smith) were to have a profound effect on my desire to be a writer. I was lucky enough to meet Guy N Smith and tell him this in person. He was very humbled and goes down as one of the nicest people I have ever met. 3. When did you know that you wanted to be a writer? I think I’d known that I wanted to tell stories in some form or other since around eight years of age. In the early days I was more into writing comic book stories and a friend of mine used to illustrate them. We would use carbon paper to painstakingly reproduce twenty comics every few weeks and sell them at school. 4. Did you write as a kid? I wrote my first full novel – a sci-fi story called Badlands – when I was around ten years of age. It was two hundred and fifty pages long and typed out on an old Corona typewriter. I still have it in the loft somewhere. It’s pretty bad! I’d written four pulp fiction novels by the time I was sixteen – all horror or sci-fi based. I sent one to Gollancz and they got back to me with a very supportive rejection letter telling me to continue. So I did! I had three pieces of poetry published in the local press when I was fourteen years old. When I experienced the thrill of seeing them in print it was like nothing I had ever experienced before on an emotional level. 5. Who were / are your influences? In terms of narrative and developing characters I’m totally floored by Steinbeck. I read Of Mice and Men in school and followed this almost immediately with Cannery Row and Grapes of Wrath. Cannery Row is my all time favourite book. Steinbeck is able to make characters come alive using a minimalist narrative. I try – and more often than not fail – to emulate him when building scenes and characters. I often try to challenge myself to place the reader within a scene with sparse narratives. Thank YOU! I kind of fell into the profession, if I’m honest. My sister is a nurse and she put me onto the idea to go into nursing when I left college. I did research and found that I was drawn more to psychiatry that generic nursing. As soon as I got into the school of nursing I knew I had made the right decision. Within a few weeks I was working on a mental health unit in Worcester (UK) and having to deal with several challenging situations. I have worked in the mental health field for over thirty years now and have seen many changes. Societal stigmatisation of the mentally ill is a bone of contention with me and I meet it head on if I ever see it, be that in real life or cyberspace. 7. How do you find the time to write with your busy schedule? I have a VERY understanding and supportive family. My wife, Justine, is amazing. I usually work to deadlines and allocate chunks of time either late at night or early in the morning when the house is quiet. I’m not one for doing a dedicated word count per day. I find this puts unnecessary pressure on my creativity. I have a short story to finish or an anthology and the deadline is late October. Chances are I shall start it in the first week of next month. 8. When not working, or writing, how do you like to spend your free time? I love spending time with the family, watching movies, making movies with VLM my production company, listening to music and, of course, reading and writing. 9. Do you have a favourite book / author you enjoy reading? See answer to number five! 10. How many books do you have available? I currently have seven novels, two collections, one academic edited textbook and two edited anthologies all doing the rounds in various guises and platforms. 11. How long does it typically take to write a book? This can vary depending on how busy I am with the day job or how quickly the story is coming together. Oh, and the deadline – let’s not forget about that! My Beatrice Beecham novels usually take about nine months. The first Necropolis Rising novel took only three months from start to final edit – but the story just flowed with that particular piece. Its sequel, Necromancer, took over a year as this was done in the middle of my Masters Degree dissertation. A short story will usually take two days to get a first draft, once the research and story are pulled together. 12. What does a day of writing look like? It’s usually measured in accumulated hours over a week. I spend the time coming up with what I want to happen in a scene. Then comes the dialogue – this is vital for me; most books stand or fail by the quality of what the author makes their characters say. Many books I have read have been beautifully written but the dialogue is absolutely dire and ruins the whole thing. I usually research chapters as I go so it remains fresh when I write it into the narrative. 13. Any new releases coming out soon? I am currently writing Dead Empire, the third Necropolis Rising book, for Severed Press. It’s early days but we’re looking for a 2016 release. Dead Silent Publishing are due to release Underground – based on a story idea by Jason Wright – later this year. It’s a typical, no brainer pulp fiction horror yarn. Also out next year is the third Beatrice Beecham novel, Cryptic Crypt. 14. Do the classics intimidate or inspire? They only serve to inspire. I certainly feel invigorated after re-reading authors like Steinbeck, Bradbury and writers such as Orwell and King. These authors have an ability to write beautiful narratives and tight, poignant stories. When I write I consider the story before how I compose a sentence; getting down to the basics and then use subsequent drafts to polish it up and get the flow. A good editor is invaluable in this process. And you must listen to them. Only the stupid or plain arrogant do not. I have been both in my lifetime and I learned harsh lessons as a result! 15. If any, what book after reading it, did you wish that you had written it? Easy. Cannery Row by Steinbeck. The characters, the sparse descriptions that create complex imagery are simply breathtaking. I never tire of the book. Never will. 16. How do you come up with your character’s names and book titles? Interesting question! In the Beatrice Beecham novels I often use names that are quirky in order to make the characters in keeping with the sleepy coastal town of Dorsal Finn. For instance Primrose Meadowsweet from Halloween Haunting is a blend of Primrose Hill and Meadowsweet Drive, two housing estates I drive past on the way to work. In other books I often join Christian names and surnames of people I’ve met or I know. Book titles are a little different. Necropolis Rising came from events in the story: a major city contaminated by a biological weapon that creates zombies that occupy the city. I was surprised it had never been used before as a zombie title so I grabbed it quick! Fearsome Feast, Fete of Fate and Cryptic Crypt are an extension of the quirkiness inherent to the Beatrice Beecham mystery novels. I love coming up with titles for that series. 17. What do you love most about writing? Being in control, I guess. You do become a little omnipotent when writing! After all, you are manipulating characters and putting them in situations that test their resolve. I recently wrote a scene where Beatrice Beecham has been emotionally destroyed and it physically hurt to write it. I actually felt guilty putting it through that scene. I think fans will be pretty pissed at me for putting her through the ringer. But characters cannot grow unless they are challenged. 18. Do you have a dream co – writer? Who? I would love to write with Stephen King. Well you did say ‘dream’ right? He was such an influence on my horror writing and to have my name with his on a book cover would be simply mind-boggling. 19. Have you ever had writers block? How did you deal with it? No. What happens is I take the story as far as I am able without consciously forcing it. When this dries up I often have several other projects on the go and I move on to one of those. This rotation approach works for me. 20. Indie Authors vs Main Stream? I find indie authors more enjoyable to read. Do you think that is true? Why / Why not? I go on the story – whether it keeps me entertained or not. I read both indie and mainstream and, to be frank, I’ve read things of quality and things that are poor in both camps. Indie writers such as Gary McMahon, Ian Woodhead, Mark West and Sean Page are well worth the investment and demonstrate the wonderful literary alchemy where quality writing, a cracking story and solid production process blend together. Take any one of these elements away and, for me, it simply does not work. This may be a controversial statement but the ability to write beautiful, grammatically correct prose does not in itself make a great story teller. Certainly it creates images in the reader’s mind and transports the reader into the writer’s world, but there is a shelf life to this and it is only a solid story that will keep them there. All too often I have read works by some authors who – as a writer – I think, ‘that is a nice piece of description’, but this is quickly followed by: ‘but nothing has really happened for the last ninety pages’. That’s when the frustration sets in. That’s when the book gets closed and put back on the shelf. This is what I love about Steinbeck – there is a happy medium and he was able to nail it. 21. I keep paper and a journal close by for poetry idea. Do you do anything like that for when you get a story idea? I used to do this, but now I’ve gone paper free, using my notes app on the iPhone. The first draft of Necropolis Rising was written in its entirety on a Blackberry so I’m comfortable using such devices as a means to capture my writing. Important point, though: transfer the files over to another source quickly for safekeeping! 22. Any advice you would give future authors? Read. LOTS. If you are drawn into the story then try to analyse how the author is doing that – is it the flow of the narrative? Is it the characters? And if so, what is the author doing that you might be able to utilise without copying the writer’s ‘voice’. Also , be prepared to accept that in order to improve your story, you need to work with an editor. Whether indie or main stream, editors are intrinsic to shaping and polishing your story. But beware! Just as the indie world has its problems with sub-standard writers, the same can be said for editors. Some are simply proof reading and labelling themselves editors. Others are very good but lack the professionalism to convey their thoughts to authors in a collaborative way, choosing instead to be arrogant and self-serving. Choose wisely but make sure that you DO get an editor. Finally, any writer needs to develop a thick skin. Once our work is out there in the hands of readers we all hope that it will be received and embraced with love. Not so. Some people will not ‘get’ what you do. That’s just the nature of personal taste. However, if you do not follow the editorial process and your work is put out there crammed full of typos and grammatical errors then expect to be savaged by someone who has paid their money to read your work. Have respect for your work, make it the best it can be and always respect reviewers. NEVER respond to negative reviews, no matter how unfair they may seem. It is seen as unprofessional and puts off future readers coming to see what your work is all about. Heated exchanges with reviewers on Amazon etc, serve only to put the author in a bad light, and make it less likely that potential readers will buy your work based on a lack of professionalism.